Lewis Hamilton has jumped to the defence of Serena Williams after her stunning outburst during Saturday's US Open final. During her 6-2 6-4 defeat to Naomi Osaka, Williams was handed a series of code violations by umpire Carlos Ramos - the first of which arrived in the opening set for what the official deemed to be on-court coaching. 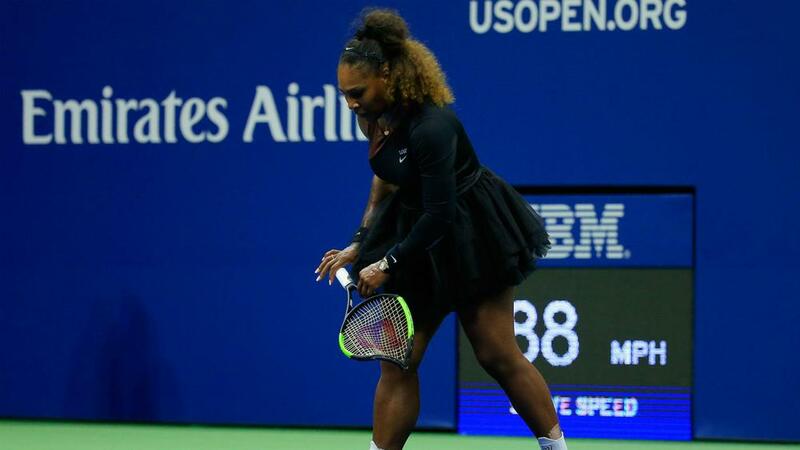 That accusation enraged Williams, who smashed her racket after being broken in the second set and was given a point penalty. The 23-time grand slam champion later confronted Ramos, labelling him a "liar" and a "cheat", for which she was docked a game. In her post-match news conference, Williams claimed that she would not have been so harshly treated if she was a man, and Formula One world champion took to social media to lend his support to the 36-year-old. "This woman is one of the greatest athletes of all time," Hamilton posted on Instagram. "I'm so proud of you @serenawilliams and inspired by your greatness, your humility and your fight against all odds. God Bless you guys. "Forever a champion. This day was sent for a reason, so that you could fulfil your purpose," added Hamilton in a second post. "What you stand for is far greater than any game won, you're an inspiration for the world and I'm inspired by you. "Congrats to Naomi Osaka, it's so great to see the mix of cultures and to see people breaking down barriers. #champions #goat."